Alright Fangirls, it’s time once more to get period-level-personal, and to talk about feminine products. Awhile back I ordered myself a GladRag; they had a deal where you could pay shipping & handling, and get the GR for free. Looking to try more non-disposable options, I placed my order and patiently waited. When it came in, I started using it, sparingly. First of all, what is a GladRag? GladRags are super absorbent, reusable menstrual pads. They’re cute colors and come in different sizes and absorbances, with the goal of being something every woman with a period could benefit from. I find them (and Thinx) appealing because they present an option that’s better for the environment and lasts longer, so it’s better for my wallet. I found that my pantyliner Sized GladRag to be insanely comfortable, especially compared to disposable pads; it has no weird sticky bits, just a snap on the bottom so the wings can keep it from falling off. It’s softer on my nethers, and there’s no risk of harming the delicate skin on my pubis or inner thighs with any sticky gunk. But it’s a little hard to get used to. Part of that is because I don’t wear pads. I rely heavily on tampons and Thinx because they keep me good to go. Pads just haven’t ever been my bit. But waking around (I walk everywhere for many reasons), I noticed that my GladRag was moving around quite a bit. I do have large thighs, which probably had a lot to do with my pad’s migratory patterns, but it really threw me for a loop. I was also a bit thrown off by the bright, cute designs on the liners and pads on their site. I like the idea of cute pads; they make periods far more cheerful. But they also get ruined. Blood is blood, and if you can’t immediately wash your rag (which is not something I’m comfortable doing in public washrooms), you’re going to get stains. I guess it confuses me that people wouldn’t be put off by buying something cute just to stain it. Unlike the Thinx, this is not something I’d be comfortable wearing without a tampon all day, but that is because I only have one. 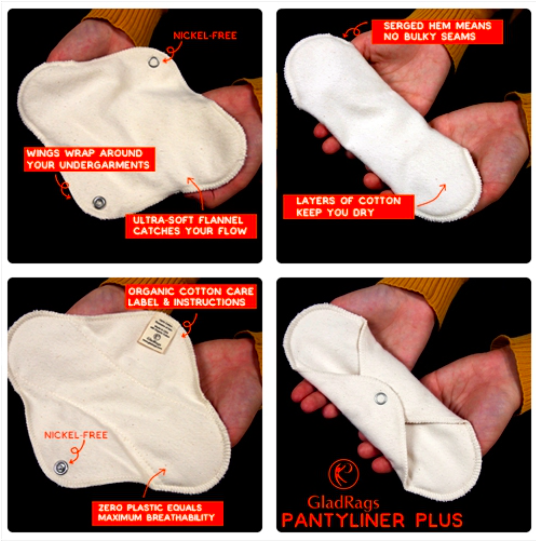 I know that my flow is too heavy for one free pantyliner to keep my undies safe all day. But GladRags does offer many options in varying absorbances (and designs), that would make going tampon free an option for me. They even have little bags for you to store used rags in, which is more appealing than attempting to wash in public, or having to carry used pads from the restroom when needing a change. Even though it took a bit to get used to, I’ll definitely be placing another order soon. I think GladRags are a phenomenal alternative to standard pads; they’re more comfortable, cute, and better for the environment. They cost from $12-$16 and are available here.